“WELL” is a relatively new concept focused on improving “the people live by developing spaces that enhance occupant health and quality of life“. The WELL Building Standard encompasses seven categories of human well-being – air, water, nourishment, light, fitness, comfort and mind – and the building must perform in each to receive certification. 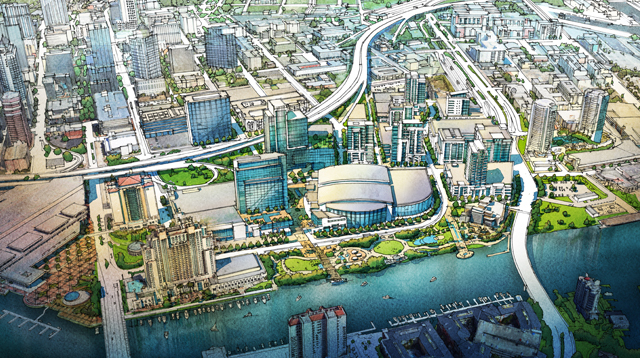 All buildings within the Tampa city district will pursue WELL Certification, including new buildings such as a 400-500 room hotel, a 650,000 square foot signature office tower, the University of South Florida Morsani College of Medicine and Heart Institute, and approximately 200,000 square feet of retail, restaurant and entertainment space. Additionally, the community itself will become the world’s first WELL Certified city district and will feature design and technology strategies including enhanced walkability, abundant green space including low pollen trees, sound barriers to support acoustic comfort, access to healthy foods, green infrastructure, daily monitoring and reporting of district air quality, and access to the amenities of an urban waterfront – all of which contribute to the wellness and quality of life of the people who live and work in the development. By combining smart city technologies and design strategies such as comprehensive air quality monitoring, low-emissions transportation, green infrastructure and walkability, the Tampa wellness city district will show that people have the choice to not only create cities that can thrive in harmony with the natural systems, but also to build communities that proactively eliminate risk factors for chronic disease. The Tampa Wellness City District will break ground in 2016 with Phase One expected to be completed within 5 years. project is targeted to break ground in 2016 with phase one to be completed within five years. It is estimated that approximately 7,500 people will directly benefit from the wellness community through living and working environments. Importantly, an additional three million people per year who are users and visitors to the Tampa wellness city district will also be positively affected.